Fritz Kuhnert, Optische Anstalt, an optics factory, had been producing optical equipment for the German Luftwaffe in the Lehener Straße of Freiburg/Breisgau, and had been destroyed in WWII. After the war its founder Fritz Kuhnert built a new factory nearby in Gundelfingen. In 1947 he introduced the Efka 24, a viewfinder camera for 24×24mm frame format. 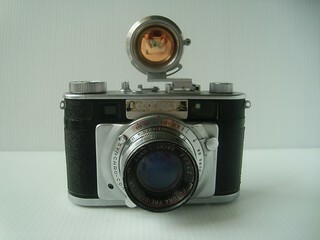 The Futura rangefinder camera became his flagship product, introduced at the first Photokina in 1950. The Hamburg ship-line owners Ernst und Eduard Komorowski took over the company an renamed it to Futura Kamerawerk GmbH. 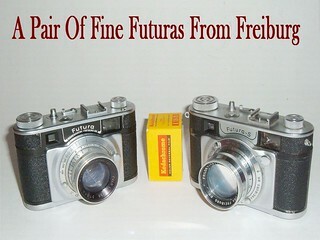 Futura marketed from 1950 to 1958 four different 35 mm rangefinders with interchangeable lenses, all with the same threaded mount. Later production (specifically the Futura S) had a modified, functional, light baffle between the flange and the shutter leaves, which serves to allow the 50mm to couple with and drive the longer lenses (see esp. the Futura Tele-Elor 5.6/90). The camera system offered two of the fastest lenses of its time, a standard lens and a portrait lens, both of the f/1.5 lens construction named Futura Frilon. In 1958 Futura stopped its production. Most Futura cameras were produced for export. Lens calculations were done by lens maker Schneider's optician Werner Giesbrecht for Futura. All lenses except Schneider's original Xenar were of Futura's own production. The lenses were named like Kuhnert's family members: Elor like his wife Eleonore, Evar und Petar like his children Eva und Peter. ↑ In 1944 his workforce comprised of 142 men and 91 women of which 41 (39 men and 2 women) were forced labour from various parts of Europe. Source: Bernd Spitzmüller (2004) Aber das Leben war unvorstellbar schwer. Die Geschichte der Zwangsarbeiter und Zwangsarbeiterinnen in Freiburg während des Zweiten Weltkriegs . Freiburg : Stadtarchiv Freiburg im Breisgau. P. 106.—The factory was destroyed in the Allied massed bomber attack on Freiburg 27 November 1944. This page was last edited on 24 October 2016, at 10:43.